In Reading Writing Interfaces, media theorist Lori Emerson demystifies the enchanted world of modern digital devices. As recent technological innovations, from the ubiquitous tablet to fully-networked smart appliances, proliferate in a seductive variety of shapes, sizes, and colors, Emerson exposes the ideological project at the heart of this digital transformation. For techno-futurists and digital utopians, the omnipresence of devices, purported to integrate seamlessly into our increasingly interconnected lifeworlds and programmed to meet, and even anticipate our needs, suggests a perfect symbiosis between digital design and human desire. Undermining these visions, Emerson claims that the dream of ubiquitous and largely invisible technological enhancements permeating our lives does not enable a utopian extension of human ability but rather, in the words of Adam Greenfield, “deprives the user of meaningful participation in the decisions that affect his or her experience” (6). Emerson develops her compelling argument not simply through an institutional or economic analysis of technological innovation, but rather by exploring the work of poets and artists, from contemporary digital and hypermedia artists such as Erik Loyer and Jason Nelson back to unexpected literary predecessors like Emily Dickenson. In so doing, Emerson aims to delineate a shared genre of media poetics dedicated to exploring, dissecting, and criticizing dominant media forms. Emerson characterizes media poetics as an artistic strategy of “hacking” media interfaces (whether the contemporary Graphic User Interface or pen and paper) in order to “turn them from transparent carriers of meaning to objects meaningful in themselves” (126). Only through an awareness of the material specificity of the interface, she argues, can we effectively account for the ways specific media shape user activity, awareness, and cognition. Emerson’s project then simultaneously contributes to a range of fields—literary studies, media theory, critical information studies—and shows how poets and artists skillfully enact critical commentary on, and expose the ideology of different media. Central to Emerson’s account is a sustained engagement with the ways that key media scholars like Marshall McLuhan enact their own poetics in order to foreground the centrality of the media interface in the process of meaning-making for the reader/viewer/user. This project is also a work of media archeology, a field developed by Friedrich Kittler, Siegfried Zielinski and others to destabilize teleological histories of media development (which, they argue, enshrine a liberal utopian ideology of technological progress) and to expose the nonlinear development—the Foucauldian ruptures, the discontinuities—in media history. As with Kittler and others, the hope is to find in dead and defunct technology the glimmer of alternative media futures. Instead of tracking the progression of digital media toward ubiquity and transparency—a dream exemplified by the Natural User Interface, and later the Google Glass project—Emerson attempts to think new media differently by looking at forgotten discourses about the potential and promise of digital media. When Emerson tracks the history and development of the modern Graphic User Interface (GUI), for instance, she notes the transformation of a notion of “transparency,” from one that indexed an opening up of the architecture of the computer (making its structure visible) in order to make it flexible and configurable for the user, to one denoting an architecture that was black-boxed and made invisible in order to make the computer “intuitively” easy-to-use irrespective of the person using it. Emerson’s media archaeological orientation not only shapes her research—constructed through extensive work with long-defunct hardware and software—but also the narrative structure of her book. Emerson tells the story of the development of interfaces backwards, starting from our current moment in which invisible interfaces dominate and the dream of ubiquitous computing reigns supreme. 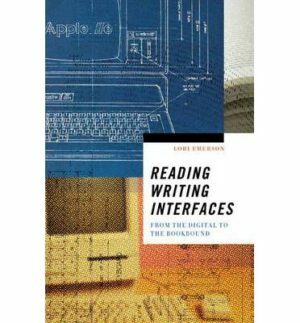 She then works her way back in time to key transformations in computer design in the 1980s and, further, to the history of the typewriter, concluding with Emily Dickenson’s experiments with paper as a particular type of reading/writing interface. The book concludes by returning to the present in a postscript on search engines. In each of these periods, Emerson attends to key literary and artistic movements and tracks their awareness of their unique media forms, moving from early computer poetry on the Apple II, through typewriter concrete poetry and onto Dickenson’s fascicles: self-published poetry booklets that were meticulously pinned together and bound by string. This structure, which moves vertiginously from the comfort and familiarity of contemporary interfaces, to the increasingly distant media experiments of the past, is crucial to her overall scholarly project. By moving backward, Emerson produces “a friction from reading new media interfaces with, into, and against old media interfaces—a friction that not only troubles the distinction between new and old but also follows in the steps of instances of (activist) media poetics throughout the twentieth and twenty-first centuries that similarly work against the grain of writing interfaces” (129). By doing so, she refuses a simple reading of past artists of media poetics as historical “precursors” to today’s experimental digital artists who play with notions of (im)materiality, interactivity and nonlinearity. Emerson insists that there are profound and meaningful differences between the types of engagement taking place at different historical junctures. At the same time, she suggests that these artists are united across their respective historical moments by a shared awareness of the interface (here meant expansively as the material technology that mediates between reader and writing) as something that should never be taken as neutral or transparent. These artists recognize that the interface “works on us, delimiting reading, writing, even thinking” and Emerson puts the myriad artists and their media in relation to one another, revisiting older media so that “we can make our current media visible once again” (130-1). The end result is that we learn to see anew the reading/writing interfaces we use every day and “look, once again, at our interfaces rather than through them” (130). In this respect, Reading Writing Interfaces also works as an unexpected and rather effective apologia for Marshall McLuhan’s uneven legacy. Emerson repurposes McLuhan’s expansive definition of media to foreground the ideological implications of technologies and their prosthetic effects. Through McLuhan, she resists the “sleight of hand” enacted by modern interfaces that make the medium seem to disappear as it is increasingly relied upon, pointing instead to the ways that these devices actually delimit rather than extend individual agency. Thus, for example, Emerson analyzes how the computer screen displays a predetermined set of human-computer interactions from which the user must choose, but which are presented as though they are the full range of possible interactions (84). In McLuhan, Emerson also finds a media archaeologist who, like herself, is “finely attuned to the literary” and whose earlier, largely neglected works such as Verbi-Voco-Visual Explorations enacted their own poetic writing, which was influenced by, and in turn influenced concrete poetry in the 1950s and 1960s (89). McLuhan, like Emerson, identified his literary heroes not simply as experimentalists but as activists who probe new and old media alike in order to make visible their shape, syntax and power. Scholars and literary activists thus work together as media hackers, testing the limits of the media form in which they operate. This approach, effective as it is in linking actors through space and time through a shared techno-political project, does produce some hermeneutic challenges for Emerson. The subjects that constitute the bulk of her literary analysis—digital and hypermedia artists, concrete poets, Emily Dickenson—are all united by their desire to “push the limits of readability and interpretation” in their works as a means through which they can make the interface visible to the reader (99). In other words, these artists’ skill is their ability to turn media form into content or, as Emerson puts it earlier in the book, “to express the medium itself” (21). For these artists, the interface is the message. Emerson recognizes her analytic work is thus reduced from one of literary interpretation to one in which, “critics have very little choice but to simply describe the unfolding experience” involved in reading or interacting with the different works she champions. Further, the import of each work is, by its very nature, ineluctably tied to the unique interface (the tablet, the typewritten page, the fascicle) in which it was originally presented. These are works that are resolutely unfungible. These factors leave Emerson’s readers on the outside of the very experiences that constitute the heart of her scholarly intervention, a dilemma only exacerbated by the book’s mute screenshots of interactive and multi-sensorial works like Mary Flanagan’s “[the house],” or the concrete poetry of Steve McCaffery or Dom Sylvester Houédard, whose vitality exists in the materiality of typewritten ink on paper. However, these limitations are not shortcomings of the book; rather, the reader’s awareness of them speaks to the success of Emerson’s project foregrounding the unique characteristics of each interface, including the academic monograph printed on acid-free paper and published by a university press. In this respect, Reading Writing Interfaces fits alongside other compelling recent works like Lisa Gitelman’s Paper Knowledge or Alexander Galloway and Eugene Thacker’s The Exploit, which simultaneously describe and enact a keen understanding the specificity of different media forms and the complex systems, predecessors, and platforms that work together to produce the “interface effect.” Emerson’s work has the cumulative effect not only of recognizing how digital media carries its own materiality—an unequivocally important intervention—but also of destabilizing past media forms like the paper-bound or bookbound text that heretofore felt stable, even knowable (154). This double effect, commenting simultaneously on the sediment of settled history as well as the breathless techno-futurism of some aspects of digital studies, is what enabled media archaeology to generate such a wealth of valuable texts over the last twenty years. This work collectively participates in the legacy of McLuhan’s ideal artist who functions as a “future historian,” using the past to discover “the unnoticed possibilities of the present” (91). Emerson’s book also works as a supplement to socio-cultural and legal scholarship analyzing recent transformations in the digital sphere, in which the rich possibilities originally imagined by the personal computer and the internet—its flexibility, its openness, its generativity—are being increasingly foreclosed. Reading Writing Interfaces can be situated alongside techno-legal analysis by scholars, including Jonathan Zittrain, Siva Vaidhyanathan, Tarleton Gillespie, Jessica Litman and others, which points to the ways in which the earlier creative and democratizing potential of the digital sphere has been closed off by a potent combination of changes in hardware and damaging reforms in the realm of intellectual property law. These scholars add depth to the picture painted by Emerson by adding that her literary heroes—the artists who experiment with and expose the limitations of new digital technologies—are themselves increasingly limited by both the devices that they use and the law that renders tampering with devices illegal and punishable as a criminal offense. Emerson’s postscript on ‘The Googlization of Literature’ uses current experiments in the construction of artwork through search engines to gesture toward the critical role of the law in digital activist poetics and to suggest future avenues of research for herself and others in the field of media and digital culture. For instance, her analysis of Tan Lin’s 2008 project HEATH or plagiarism/outsource, notes towards the definition of culture, untilted Heath Ledger project, a history of the search engine, disco OS and John Cayley and Daniel C. Howe’s How It Is in Common Tongues recognizes how future experiments in digital poetry, by “writing through” the growing mass of online data available through the internet, may be violating both copyright and increasingly constraining licensing agreements. Without diminishing the importance of the connections Emerson builds between eras, the legal and political connotations of these artists’ work differ in scale, if not in kind, from earlier artists engaged in an activist media poetics. For these artists, developing true literacy in the algorithms, protocols, and software that invisibly shape our digital lives—a necessity for producing the kind of art that foregrounds the interface for the reader—might now involve not merely artistic invention, but acts of hacking, piracy and technological circumvention outlawed by the current iteration of the Digital Millennium Copyright Act. Emerson recognizes this challenge for future artists in her conclusion, noting how question of access will be central to future artists and activists. Ironically, “that supposedly antiquated device, the book, is fast becoming a safe haven for reading writing because its particulars cannot be tracked, monitored, indexed, fed into an algorithm, and given back to us as a commodity” (184). Here too, Emerson is aware of the unique poetry of this quixotic turn of events in the adolescent years of the twenty-first century. The future of digital activism may lie in the material of the bookbound. Galloway, Alexander and Eugene Thacker. The Exploit: A Theory of Networks. Minneapolis: University of Minnesota Press, 2007. Gillespie, Tarleton. Wired Shut: Copyright and the Shape of Digital Culture. Cambridge: MIT Press, 2007. Gitelman, Lisa. Paper Knowledge: Toward a Media History of Documents. Durham: Duke University Press, 2014. Litman, Jessica. Digital Copyright. Amherst: Prometheus Books, 2001. Mackinnon, Rebecca. Consent of the Networked: The Worldwide Struggle for Internet Freedom. New York: Basic Book, 2012. Vaidhyanathan, Siva. The Googlization of Everything (and Why We Should Worry). Berkeley: University of California Press, 2011. Zittrain, Jonathan. The Future of the Internet and How to Stop It. New Haven: Yale University Press, 2008. Andrew Ventimiglia is a Research Fellow at the TC Beirne School of Law at the University of Queensland. He was awarded his PhD in Cultural Studies from University of California – Davis in 2015, during which he conducted research into the intersection of religion and intellectual property law in the American spiritual marketplace. While at UC Davis, Andrew also worked at the Centre for Science and Innovation Studies and the Science and Technology Studies program. Andrew additionally holds a Master of Arts in Cinema Studies and a Certificate from the Culture and Media Program from New York University. His current research looks at the development of precision agriculture in Australia and the United States, particularly as this emerging industry produces new streams of proprietary data and reconfigures relationships between agricultural corporations, farmers and land.